We here at Calendar Lady Promotions want your company to thrive, that's why we've just ordered in so many Euro 2019 and Sporting merchandise to help you stay advertised. 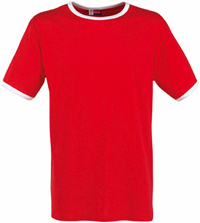 Our Company Adelaide Contrast Euro 2019 T Shirts are dual colour T Shirts that will come with your business details and company logo printed upon to help keep you promoted during the events. To find out more about our Company Adelaide Contrast Euro 2019 T Shirts click here and fill in the contact form and we'll get straight back to you. Other promotional and personalised items besides our Company Adelaide Contrast Euro 2019 T Shirts click here.